Ailbhe Ní Ghearbhuigh was born in 1984 in Tralee, Ireland. In 2005 she graduated with a BA in Irish and French in Galway. After the master's degree she taught Irish language and literature. In 2007 she received a Fulbright Scholarship and taught Irish in New York. Ailbhe Ní Ghearbhuigh writes her poems in Irish, as well as her occasional posts for 'Beocheist', the Irish-language column in the 'Irish Times'. Recently, she won with her poem 'Deireadh na Feide' (Last breath) the Corn Uí Neill Wetearlier price. 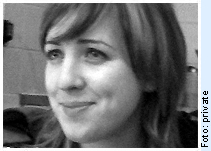 'Péacadh', her first volume of poetry, was published in 2008 in Coiscéim.